Blood Willow by Thomas Bloor. This extraordinary book signals a new direction for Bloor. Themes and influences range from werewolf movies to Grange Hill, from The Voyage of the Dawn Treader to Beowulf, and from the mysteries of the Knights Templers to humankind's unfortunate history of persistent cultural misunderstanding. Elements of the story are drawn from many sources, including British and Chinese folk tales and myths. 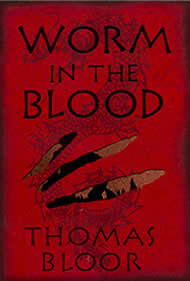 The author is currently at work on the sequel to Worm in the Blood, which will be published by Faber and Faber in 2006. "It�s a great idea, beautifully set up and explained, and, like the best thrillers, it unravels its secrets scale by minute scale, using each of its 250-odd pages to maximum, gripping effect." "Bloor has woven myth, fantasy and harsh reality into this riveting story." "An edgy but hugely gripping cross-over children�s book." Take the quick 'Worm in the Blood' quiz!. Front cover artwork: by Donna Payne. Inside cover: by Mark Edwards.